As announced, the Forum for Discussion and Proposals is opening today, 19th of September. It will be open until the 31st of October 2008. Information on the Inverted School 2009 (open to you) will be given during the closing session, Friday 5th of August, 16:00. CSC has been featured in this week edition of "Technical Weekly", the first weekly journal on Technology in Norway. The journal has a paper as well as a web edition, and the series of articles on CSC is present on both. Fact and figures for the 2008 Examination. Individual marks will be available on demand (email) from Ivica Puljak (Ivica.Puljak AT cern.ch) after the closing ceremony. Warmest congratulations to the 47 successful students. Sometimes between now and the beginning of the examination, the wireless access at GUC will be cut. Traditional CSC football match ends in a draw 8 to 8 between Yellow team and Red Team. Sep Access to Exercise Room before examination At 14:30, right after this Afternoon exercise session (13:30-14:30), all students will be asked to leave the room, so as it can be prepared for the examination. Therefore, no way to use the exercise computers between 14:30 and about 19:00 (when examination is over). The photo gallery will be unavailable for posting this afternoon between 13:30 and 14:30 (during the exercise session. The evaluation questionnaire is compulsory. Wellness Area, open today to CSC participants from 18:00 to 22:00. Please, do not dive (jump) into any bath (has happened last night), including the larger one. Among many other possibilities, students may visit Lillehammer this afternoon. Choice of Basketball, Volleyball, ... and Squash. This afternoon, those who would like to try ultimate (using freebee) may just send an e-mail to Thomas Guerin. This fun and easy sport is open to everyone (ladies and gentlemen). If you are curious to know what Ultimate is, you can have a look at the video. If there is enough people interested (minimum 8 ) an ultimate session could be organized on the football field at 13:30. The first time you register to post photos, you must provide the PW that you got on paper when you arrived at the school. If you lost it, simply ask Thomas Guerin. Team 1, Fabienne Baud Lavigne and David Gonzalez Maline defeat Team 2, Regina Kwee and Ryu Seangchan by 27-15 in the final of the CSC2008 Badminton Tournament. The results of the Badminton Tournament are now available. Congratulations to Fabienne Baud Lavigne and David Gonzalez Maline who won the Badminton Tournament. You may register to both events or only the dinner before Wednesday, 11:30. Note: Those not joining the cruise will be on their own for the dinner. All five teams will play a championship, each team meeting the 4 others in a 10 minute match. All match will have a winner. When time is over, the ongoing point is finished and accounted. If there is a draw at that time, a golden point is played. At the end of the championship (10 matches), teams are ranked according to their number of victories. If two teams have the same number of victories, the winner of the mach between the two in the championing will take precedence. The 1st and 2nd team in the championship will meet for in the final. Many thanks to the 5 participants who made proposals. As said all 5 have been accepted. for next Tuesday at 16:00. Exceptionally, Tuesday 2nd, the morning lectures will take place in room K102, next to the usual room K105. Tuesday 2nd Note that the lunch, tomorrow, Tuesday 2nd Sep, will not take place at the usual place, but in building C.
We will gather at 12:40 at the "coffee break'' place and go to Building C with Kari. 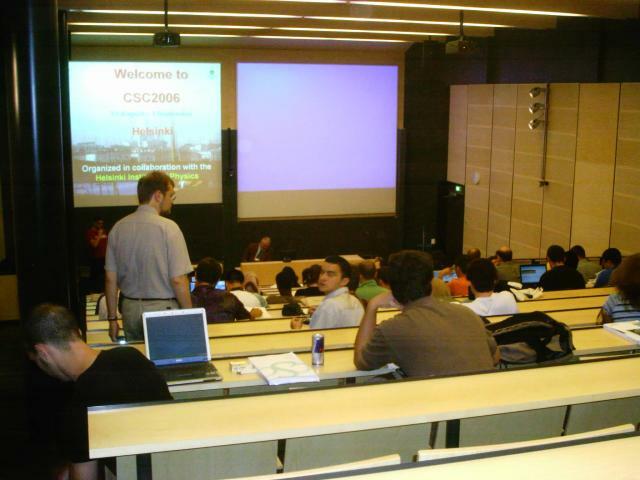 The presentation of the CSC Examination will take place today at 16:45 in the lecture room. For this reason, the coffee break will be at 16:15. Basket ball is proposed in addition to Badminton in the Main Sport Hall. Still time to register. Teams will be drawn from a hat at 12:30 today. Welcome to Ivica Puljak, Chair-person of the Local Organizing Committee for CSC2007 in Dubrovnik and member of the CSC Advisory Committee, who is joining us from today. The CSC 2008 Gallery awaits your pictures. Do not hesitate to post them. How to post and view. We are pleased to announce that all the 5 excellent proposals have been accepted for presentation on Tuesday 2nd, p.m.
Our Security and Volleyball professor, Alberto, has captured some of the most memorable moments off CSC Week 1. We remind you that the evaluation questionnaire is open. You can access and modify it as many times as you want. The third timeslot for our CSC special access to the Hotel Spa and Wellness area, initially planed today, is cancelled. No access today for CSC participants. Beware, bring mandatorily your GUC Photo Access Card with you. Among many other possibilities, students may visit Lillehammer Saturday afternoon. The second timeslot for our CSC special access to the Hotel Spa and Wellness area is today, Friday 29th, 19:30 -22:00. Request a card at the Thon Hotel from the Front Desk (with your CSC Badge) and get to the wellness area. After Analysis of the results of the contest, as stopped at 09:00 Friday 29th of August, the jury of the CSC Security Contest is pleased to announce the following. Mr Remi Mollon is declared the Best Performing Student in Software Security at the CERN School of Computing 2008. Mr. Mollon obtained a mark of 9 out of 10 in the Software Security Practical Session. The traditional CSC football match will take place Wednesday 3rd of September late afternoon (18:00-19:45) on a full -size grass football pitch. A Mixed-Double Badminton Tournament is organized Tuesday 2nd at 13:30. Register here if you wish to participate. Teams will be drawn from a hat the Monday 1st at 12:30 in the lecture room (just after the last lecture). The session of selected presentations from students will take place Tuesday 2nd at 16:00. See schedule of week 2. Hikers should ensure they have 28 NOK to pay the return bus. Keep the ticket, Kari will refund. As time will be short, a CSC dedicated bus will leave the Campus to the Thon hotel at 13:15 sharp. The participants list for the Sport/Excursion Afternoon is now available. We have arranged for special access to the the Hotel Spa and Wellness area for 5 days at special times. The first timeslot is today, 28th, 19:30 -22:00. Perfect option after the sport day. What is available in the area. 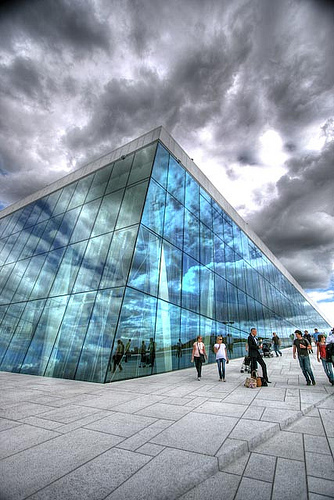 Registrations for the Oslo Excursion (31th) open today at 11:00. The registration will close on Friday 29th at 17:00. Reminder: tonight, at 19:30, Student House (Huset): Information Security Thematic Evening. The Norwegian Information Security Laboratory (NISlab) will present their activities, as well as unique opportunities for studies and PhDs positions in the Gj?vik NISlab. These opportunities may interest you or colleagues you know. The evening will include drinks and food in a relaxed ambiance. Today is the first day where you can access the Indoor Swimming pool (plus Exercise room and sauna). Football is part of the programme every day. Today, the GUC football team will resume their training at 14:30. The young coach, Odd Amund Wik proposed that we play with them. As the reserve hours (16:00 -17:00) has been turned to free time (see news 15), this is a good opportunity to have a football session with Norwegian friends (even possibly after other activities for those in good condition). Squash is possible everyday (3 courts). Francois is most wiling to show it to beginners . Easy (when plaid gently) a fun. As usual, daily sport programme today. Today, we start Basket ball in the Sport Hall. At 11:00, we will poll to decide whether for the other sport in the Hall, we start with Floorball or VolleyBall. The schedule had planned this Wednesday a reserved hour between 16:00 and 17:00. I am pleased to announce hat this hour will not be used for classes and is therefore left free. Results of the registration process will be given this Wednesday at 11:00 as part of today's announcements. A list of possibilities for your hot evenings and nights in Gj?vik is now at your disposal. If you find a new interesting place, do not hesitate to send an email to let us know. The questionnaire form is now available. You can access and modify it as many times as you want. As morning buses are driving pupils to schools, just before picking up us, they have sometimes difficulties to be there at 08:30 sharp, as you noticed. Therefore, it is simple to move the morning departure time by 10 min. We remind you that the registration for the Sport/Excursion afternoon (28th) close today at 17h00. Please indicate your choice even if it is 'Nothing' or 'Lillehammer'. The CSC 2008 gallery is now open, but before using it please read carefully the instructions. An afternoon with a choice of activities is proposed for the Thursday 28th. 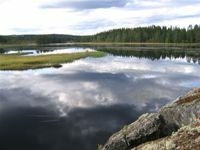 This includes a choice of sports, several being in parallel, and free excursion to Lillehammer (you may also choose none of these activities and be on your own). even though you prefer to be on your own. You are all invited to a Welcome Reception, Monday 25th of August which will take place in the Olympic Cavern Hall (5 min. walk from the campus) at 19:30. We will gather at 19:20 in the Entrance Hall of the building A (Exercise room building) for a group walk. The reception is kindly offered by the City of Gjovik. The Opening Ceremony will take place the 25th of August at 09:00 in the Eureka 1/3" Auditorium, Building H-f of the GUC. You will be guided to the room when getting out of the bus. Note that all the other lectures will take place in another room. If you wish access to the wireless network on the GUC campus, fill out the form given to you at registration time, and return it at 11:30 Monday 25th (just before the 1st lecture which will follow the opening ceremony). The participants who will arrive too late for the school registration on the Sunday afternoon should contact the Hotel registration counter to obtain a letter with the latest instructions for Monday morning (25th of August).